Global Warming is a serious threat refers to increase in temperate of earth due to green house effect. Let your kid know about global warming its causes, affects and solution by reading the given essays on Global Warming. Global warming is a very dangerous issue of our world today. Responsible for new diseases, health problems and land loss and this issue deserves serious attention. Scientists proved that human are responsible for most of the global warming over the last fifty years. Our actions have permanently diversified the chemical arrangement of our atmosphere for the worst. By increasing greenhouse gases, mainly carbon dioxide, methane, and nitrous oxide, we are trapping heat in the atmosphere and increasing the average temperature of the earth. 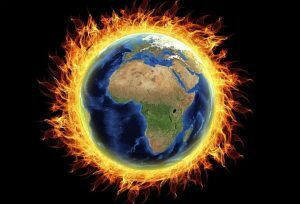 Higher temperatures on earth can cause many dangers to humans. Many natural disasters would also occur due to climatic change. Typhoons, Hurricanes, Tornadoes, Floods, and Droughts are some natural disasters that would be more common on earth with Global Warming. So we have to take some serious step to save our earth and to live healthy life. Global warming is defined as the increase in the global temperature to a level which affects the life-forms on the earth. The factors responsible for global warming are both natural and man-made. The climate of earth varies continuously. The earth remains warm due to the green house effect. Without it the earth would be a frozen waste land. The short wave lengths or UV radiation coming from the sun penetrates the atmosphere and is trapped by the earth. The earth atmosphere has gases that trap some of the outgoing radiation and earth get warm. The rising greenhouse gases in the atmosphere can reinforce the greenhouse effect and lead to global warming. Carbon dioxide is the great contributor to the global warming. The main reason behind global warming are natural happening as well as man-made activities. Volcanic eruptions and forest fire are some of the natural reasons but deforestation, along with increased consumption of fossil fuels are responsible for increase in carbon dioxide content that result in Global Warming. Global warming is a great threat to the flora and fauna of the earth. A large number of species of them may become extinct. Hence, reduction in the use of fossil fuels and afforestation is a necessary step that one should take. Along with reduction in the use of fossil fuels, the use of the house hold fuels like wood coal, Kerosene should also be reduced by encouraging LPG stove and bio-gas plants as they cause less atmospheric pollution. We cannot help in natural disorders but we can control ourselves. We can reduce the threat of the global warming to a great extent by Planting more and more trees and reducing timber cuts worldwide, it can help restore the imbalance. Every individual should be aware of the importance of protecting the environment. Global warming refers to the climatic change on the earth that causes an increase in the average of temperature. However it can be causes by natural disasters and human who are responsible in contributing an increase in average temperatures. Global warming is a serious environmental issue on earth. There are two issues that cause global warming including Natural Cause and human influences. Natural Cause – Natural Causes of Global Warming is defined as the climate is changing for centuries. The global warming caused because the sun rotating around the earth continuously changing the intensity of heat. Another cause of global warming is greenhouse gases. Greenhouse gases are carbon monoxide and sulphur dioxide it trap the solar heats rays and stop it from escaping from the surface of the earth and the temperature rises automatically. Volcanic eruptions is also a cause for global warming, a single volcanic eruption will release a large amount of CO2 and ash to the atmosphere. Once carbon dioxide increase, the temperature of earth also increase. Methane is another issue that causes global warming. Methane is also a greenhouse gas it is 20 time effective than CO2 in trapping heat in the atmosphere. Human Influences – Human influence is a main cause of Global Warming because we Human do not take care of earth. The earth has changed for many years and it is still changing because of modern lifestyle of human. Human activities that are causing Global Warming includes industrial production, mining, burning of fossil fuel, cattle rearing or deforestation. Industries have been using fossil fuels in power machines. Everything that we buy is produced by machines and all machines use fossil fuels, during the process carbon dioxide is released in the atmosphere causing Global Warming. Transportation is also a reason like cars and bikes all personal vehicle is also releasing carbon dioxide from exhaust. During the process of mining, the methane will trap under the earth. And during rearing cattle it will also produce methane because cattle released the form of manure. Another most common cause is Deforestation because human have cut down trees to make papers, cutting woods to build houses. If human continuing deforestation, carbon dioxide will concentrate in the atmosphere. Millions of people are breathing and releasing carbon dioxide to the atmosphere but there are less number of trees to absorb CO2. The effect causing because of global warming on earth are extremely serious. There are many more dangerous effects that can happen in the future if global warming continues. That includes economic consequences, polar ice caps melting, warmer waters and more hurricanes, spread of diseases and earthquake. How we can prevent our earth from Global Warming. We human and governments need to take steps to implement the global warming solutions. To reduce global warming we have reduce the contribution of greenhouse gases to the atmosphere. Therefore, to reduce global warming it is necessary to reduce the use of gasoline, we have to use limited electricity , we should travel by public transport instead of using personal vehicle it will help reducing carbon dioxide. Another way to reduce global warming is recycling it will reduce garbage by reusing plastic bags, bottles, papers and glass and we all have to grow more and more trees. In simple words our earth is sick and We humans need to Heal the earth. Global Warming have causes many problem for human and we human have to start saving the earth.